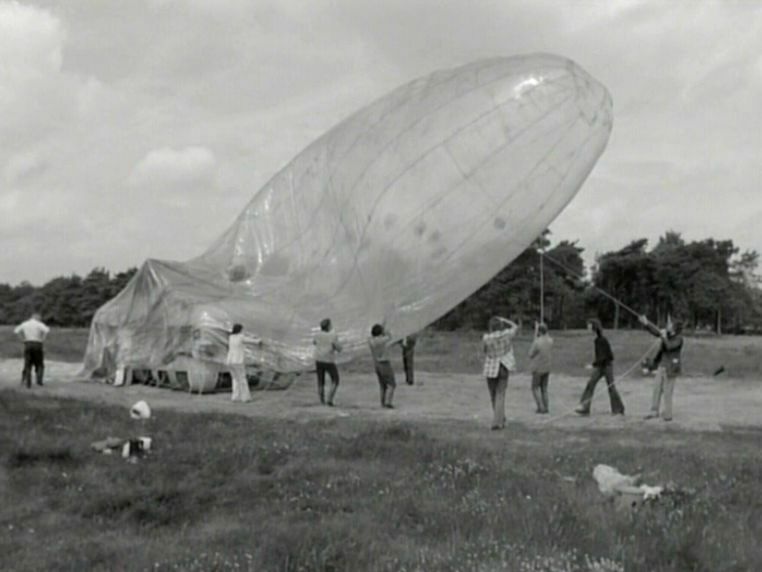 The 1971 Sonsbeek exhibition was subtitled 'Sonsbeek buiten de perken' (literally: "Sonsbeek Beyond Its Bounds", or freely as: "Sonsbeek Let Loose"). It was not limited to the confines of the park, but instead stretched out over all the Dutch nation. This was the period of land art, conceptual art, process art, minimal art, performance, and video; the traditional socle sculpture had disappeared. In ’Sonsbeek Beyond Its Bounds’ the concept of sculpture as such was put to discussion, as well as the way in which the work of art functions in the environment it was put in. 00’00" Leader. Cartoon and action-packed scenes. Announcement of the event by a newscaster on Dutch television. 00’33" Montage of works of art at Arnhem (Sonsbeek Park), Maastricht, Santpoort, Tropenmuseum Amsterdam. Emmen (site of Robert Smithson’s work). Liaison via the Arnhem communications centre. 03’05" Title 03’12" Panamarenko, Fiszman Isi and some assistants preparing the assembly of a work/zeppelin in Balen. Failure of the assembly. Picnic, with Panamarenko explaining his plans. 11’25" Title. Wim Beeren, the exhibition organizer, talking about its general themes. 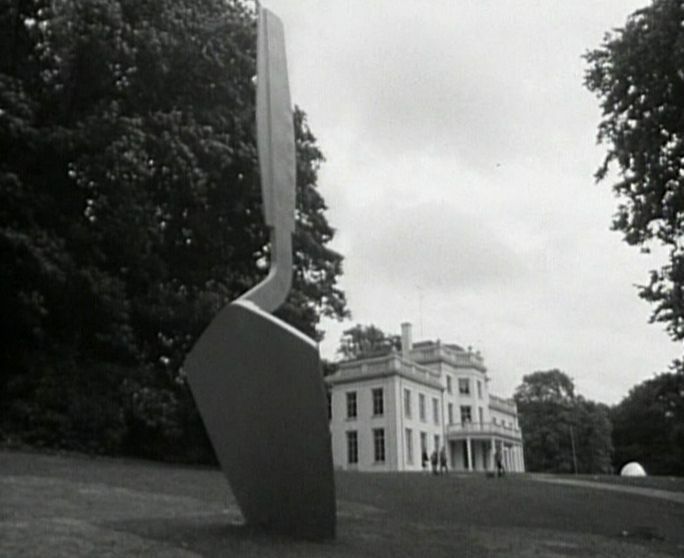 12’40" Interview with Claes Oldenburg. View of the preparatory drawing of his work and of the finished work. 15’10" Wim Beeren explaining the aim of the event. Views of works. 18’22" Interview with Robert Smithson about his work Broken Circle. 22’08" Two critics criticizing the elitist and obsolete nature of the event. Wim Beeren defending his idea. 24’15" Karl Maiden talking about Triangle Gigantesque (Giant Triangle). Children playing on the work. 26’23" Two critics. 27’20" Communications centre. During the opening ceremony, conference over the phone between the towns involved in the event. 31’00" Town councillors in charge of finances and culture discussing the meaning (or lack of meaning) of the event. 32’40" Wim Beeren and the councillors talking about how the event was financed. 38’18" View of the park from the communications centre, a round glass structure. Debate between the organizer and the public. 39’15" Two critics and one of the curators. Inscription on the ground in front of the park entrance. 42’00" Video and television equipment being used by the public. 43’35" Robert Morris on the site of his project. Models and work in progress. 44’45" Daniel Buren talking about his project for the Stedelijk Museum, Antwerp. 47’35" Credits. Picture of Sonsbeek Park. 47’50"